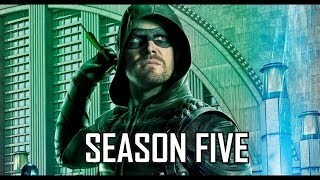 In Season Five, Newly appointed Mayor Oliver Queen finds himself challenged as he fights on two fronts for the future of Star City. With his right hand, John Diggle, back in the military and his sister Thea adamant about hanging up her vigilante hood as Speedy, Team Green Arrow is down to just Oliver and Felicity – but they’re no longer the only vigilantes in town. Green Arrow’s public defeat of Damien Darhk at the end of Season Four has inspired a new crop of masked heroes to step up and defend the city, though their painful inexperience makes them obstacles rather than allies in the field. The arrival of a deadly new adversary will force Oliver to confront questions about his own legacy, both as mayor and as the Green Arrow. Echo Kellum joins the cast in Season Five as brilliant inventor Curtis Holt.